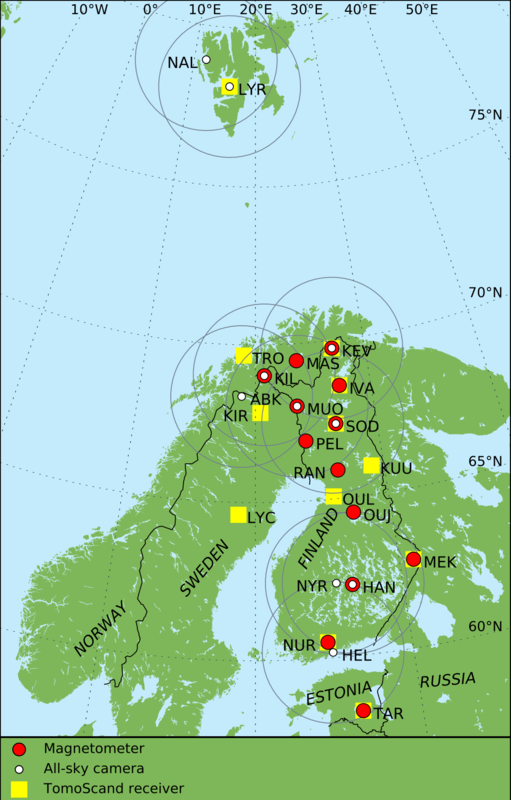 The Magnetometers - Ionospheric Radars- Allsky Cameras Large Experiment (MIRACLE) is a two-dimensional instrument network constructed for mesoscale studies of auroral electrodynamics, which is maintained and operated as international collaboration under the leadership of the Finnish Meteorological Institute. The network covers an area from subauroral to polar cap latitudes over a longitude range of about two hours of local time (MIRACLE on a map: jpg/pdf file). The various instruments have different spatial resolutions, but basically the network is designed for studies in the spatial scales from a few tens of km upward. 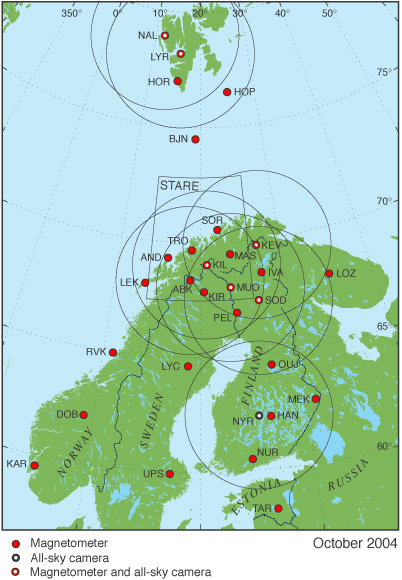 In standard operation mode the time resolution of magnetic observations is 10 s, while the sampling rate of the radar and the all-sky cameras is 20 s.
Several ESA and NASA spacecraft are in orbits suitable for monitoring different magnetosphere-ionosphere-thermosphere coupling processes driven by the solar activity. MIRACLE observations support these satellite measurements by providing important information on the ionospheric boundary conditions. During recent years, MIRACLE studies have used data especially from the ESA's CLUSTER II mission, which was launched in 2000. The Cluster constallation of four satellites can be used in the studies of such magnetic phenomena whose ionospheric footprint signatures are of similar size as the MIRACLE field-of-view. Thus, combined MIRACLE and Cluster observations have been useful e.g. when studying localized flow bursts in the plasma sheet. Further, extensive MIRACLE studies are carried out in collaboration with low-orbiting satellite missions. One of the most important is ESA's CHAMP mission, and in the future with the SWARM mission, launched in 2013. During passes of the satellites over MIRACLE, the combination of the magnetic and electric field data in the upper ionosphere as measured by the satellites and the ground-based data allows for detailed studies of ionospheric electrodynamics and energy transfer into the ionosphere. Data of several thousands of such overpasses have been combined to a comprehensive model of the state of the ionosphere-magnetosphere system during different Geospace conditions. MIRACLE observations also support the NASA's THEMIS mission, which was launched in 2007. 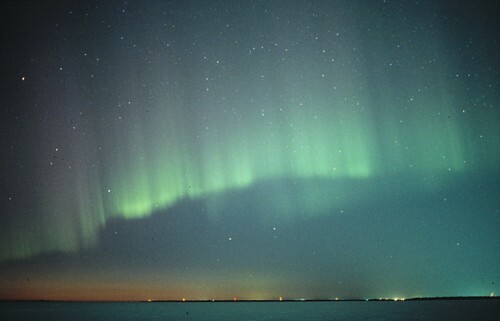 When the THEMIS configuration of five satellites and an extensive ground-based instrumentation (in Canada and Alaska) monitor substorm activity in the nightside, the MIRACLE networks records the simultaneous dayside energy input from the solar wind. Close collaboration between the MIRACLE and THEMIS communities in sharig data disseminationa and analysis procedures facilitates the combined usage of observations from both networks.